Sorry for the lack of posts over the past week or two, but I had gone on vacation and pretty much took a break from blogging for a bit. In addition, life had gotten in the way and to attend to some other things. In the meantime, the 2010 baseball season in winding down and it’s a big surprise to me that the Texas Rangers and the San Francisco Giants are against one another for the championship. Personally, I would have expected Texas to win the American League pennant (or maybe New York), but the Giants I didn’t see taking the National League at all. I’m sure most fans expected to see the Philadelphia Phillies with their big payroll, high-powered offense and the pitching triumvirate of Roy Halladay, Roy Oswalt and Cole Hamels in the World Series. Let's not forget the Yankees -- I go can on and on about them; however, one has to think they will have to think about their aging playing and the lack of pitching efficiency in the ALCS. Again, I sure as hell didn’t see the Giants playing for it all. I mean they have a real strong pitching corps with two-time Cy Young award winner Tim Lincecum, Matt Cain, Jonathan Sanchez in the fold; however, their everyday lineup perhaps with exception of Buster Posey are filled with non-household names and veteran who have been around the league. They are an odd team for sure. With the roster they have (Aubrey Huff, Pat Burrell (? ), Edgar Reneteria, Freddy Sanchez, Cody Ross, Andres Torres & Juan Uribe) don’t note anything special, but they have come together and won. Heck, their highest paid player - Barry Zito - was ommitted from the post-season roster! I’ve never seen a hodgepodge of players such as the Giants play in the World Series, but like they say you can’t script October and games aren’t decided on paper, in the media, or online. That being said, I’ll be rooting for the Giants since they have a handful of former Orioles (Huff, Eli Whiteside, Mike Fontenot and Chris Ray) who suited up for the this year. Nothing against Texas and they definitely would make a fine champion, but the Giants would make one hell of a story if they win it all. Plus, Cliff Lee losing that first game, combined with a litany of Texas errors may have swung the pendulum in the Giants’ favor. With the Orioles' season over and my day job in full swing life has torn me away from the internet. This morning, however, I find myself with some time to rattle off some of the thoughts that have meandered through my baseball mind the past week. Meandered like a shallow stream through an autumnal glen; or a small child lost in the mall. -If I hear the phrase, "Great series - no one will watch it," one more time I am going to need bail money. Yes, we get it. Texas and San Fran are not the markets of Philly and NYC. We get it. We get that West Coast teams not based in LA are largely ignored by the national mind with its rather large Eastern bias. But guess what, the networks only really care about four maybe five teams anyway so odds are there is going to be a series every once and awhile that "no one" will watch. The snark behind that comment always drives me nuts. The people in San Francisco will certainly watch it as will all of the people in the greater Dallas-Arlington-Fort Worth metro area. That is who we should be worrying about. Don't these teams deserve a chance to play on the big stage just as much as the Yankees, Phillies, Red Sox and Angles? -As you all know by now the Yankees lost and were knocked out of the playoffs again. I know I am just all broken up about that. Haven't been able to sleep for days. Neither has the NYC press which has been, delightfully, all over the Yankees. What does this have to do with the Orioles? Because as Mike Lupica in the Daily News and the Joel Sherman in the NY Post bring up - the Yankees are getting old. Next season Jeter will be 37, Posada will be 40, Rivera will be 41and as these players have aged everyone has expected them to finally succumb to age like EVERY player - especially Posada. But the problem is they never seem to do it. After the lackluster performance in the ALCS people are starting to seriously look at this Yankee team and wonder how it will go on from here. This is great news for the Orioles. The Yankees simply have to bring back Jeter and Rivera. I mean, I think Yankee fans could deal with Posada going and even Pettite but not Jeter. Jeter is Ripken. In the Sherman piece linked above he likens Jeter to Ripken as both a blessing and a curse. The difference here is that as Ripken aged he was able to shift over to third to keep from being anything less than a defensive asset to the team - Jeter and the Yankees do not have that option with a soon to be 36 year-old A-Rod and his albatross-like contract parked at third base. The Yankees have to bring him back he is the international face of a near-trillion dollar empire, but in the sense of good baseball it is probably a bad idea, but they are stick with him. Again, great for the Orioles? Because if the Yankees have to trot out an older version of Jeter 162 times a year that makes them just that much weaker. Going out and getting Cliff Lee and Carl Crawford can help but the Yankees are getting old quickly in key positions with next to no help in the minor leagues and huge contracts that no other team could take on in a trade. The more questions the Yankees have this offseason the better. I think we are seeing a team finally on the downswing. As we are well into the MLB Playoffs, it seems like the 2010 regular season didn’t end just nine days ago – rather it feels like it’s been a month or so. On October 3rd, the season for the Orioles came to a conclusion. Despite a 66-96 record, for the first time in perhaps a decade plus, there’s some tangible hope for fans. Under Buck Showalter, the team played well over .500, finishing up with a 34-23 record. They wound up splitting a four-game series at the very end, but they didn’t fold at all towards the homestretch. Frankly, they looked like they could compete with any team in baseball. It was quite astonishing – albeit, in a good way to witness. The young pitching rose to the occasion – especially Brad Bergesen and Brian Matusz (who recovered from poor starts to the season), the team got injured players back and the hitters seemed to do much better in the clutch. As we all saw in the final months of the season, the team does have pieces to build upon for the future. However, it’s also pretty obvious that they need help – a big bat, perhaps another starter, help at the corner positions, and also another bullpen arm. Brian Matusz was masterful last night. Six innings pitched, a career-high nine strikeouts and one earned run. The run came on a homerun in the second inning courtesy of Brandon Inge; Matusz did not allow a Tiger reach second base for the rest of his start. Matusz's final line: 10-12, 4.30 ERA, 1.34 WHIP, 7.1 K/9. Nice. At the beginning of the year Matusz was on a lot of writer's short-lists for Rookie of the Year, as the Orioles went into their tailspin those thoughts went down with it. But Matusz deserves votes. He deserves to be a serious contender, but I know he won't be. Look at the way Matusz has pitched in the second half: 3.63 ERA, 7-3, 7.9 SO/9. Since Showalter has joined the team in August Matusz has just one loss against seven wins and an ERA of 2.11! Matusz leads American League rookie starters in strikeouts, innings pitched, fewest walks, starts, WHIP and is second only to Wade Davis in ERA by .16. Matusz deserves to be in the Rookie of the Year conversation, and last night dominant performance put an exclamation point on that argument. Last night's win was a lot more meaningful than some may realize. First, the obscure, that win tied an MLB record for wins after futility (I made that up). After a team has recorded their 73 loss, only one other team has won at least 37 games (Terry Francona's Phillies). Also, more importantly and visible, last night's win means that the Orioles will have no worse than a .500 record in the second half of the season. Let me repeat that. No matter what happens today, the Orioles will have played at least .500 ball in the second half. This team was THIRTY (!) games under .500 at the break and was challenging for the worst recod of all time. They have played .500 ball since and have a chance to finish the second half over .500 with a win today. If that happens it will be the first time since 2004 and only the second time since 1997 the Orioles finish strong. With the season down its final two games, I’m happy this team didn’t fold towards the end like they during the past decade. It’s clearly evident with the doubleheader sweep yesterday against the Detroit Tigers and taking two-out-of-three from the playoff bound Tampa Bay Rays. 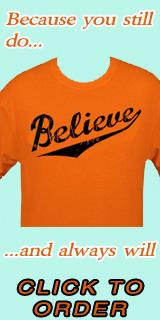 It’s obvious that the Orioles do have some keys to rebuilding what was once a proud franchise. However, it’s also pretty obvious that they need help – a big bat, perhaps another starter, help at the corner positions, and also another bullpen arm. The holes must be plugged in. They may be better in 2011, but even with improvements, will they contend against the best in the East? The Rays may slip some because of the inevitable departures of Carl Crawford and Carlos Pena; however, the financial wherewithal of the Yankees and Red Sox will always make them threats. The Jays, in the past several seasons have always managed to put a good team out on the field and this season is no exception.